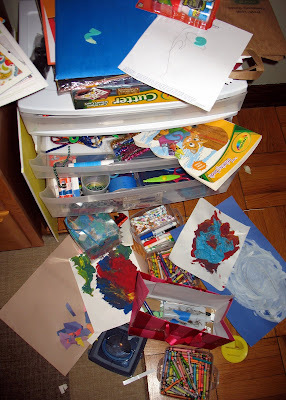 The 28-Day Organizing Challenge at I'm an Organizing Junkie officially ends today. Although I didn't accomplish everything I had hoped to this month, I'm quite proud of what I was able to do — and in only 28 days! Public accountability sure does wonders for your motivation, huh? The Organizing Junkie has asked each challenge participant to answer a few basic questions about their experience. I'm sure I'm not alone in saying that TIME was my biggest challenge. I'm a mom, a wife and a part-time worker. Finding enough hours in the day to go above and beyond regular maintenance cleaning is tough. I ended up doing much of my work on weekends or on my Tuesday off. My small space was another big challenge. 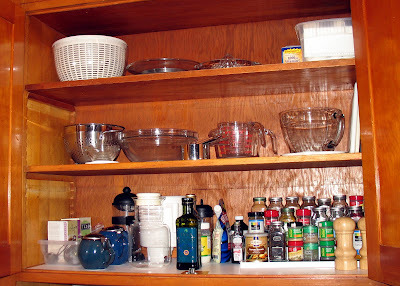 I looked to the Internet for resources from other tiny kitchen cooks. That's how I learned about the wonder of pegboard! 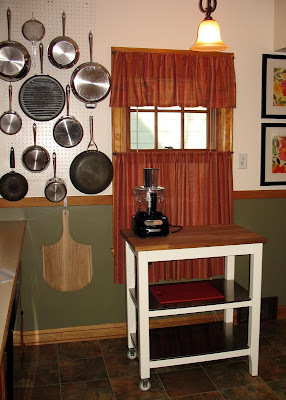 Because I have such a small kitchen, I had to think through my work "zones" to make the best use of my limited space. 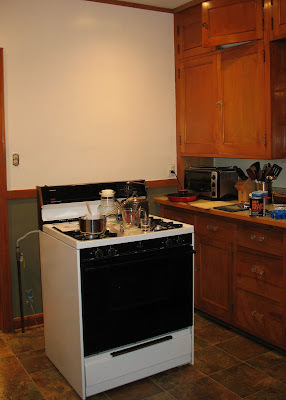 As you can see in the picture below, I now have clearly defined areas for prep/cooking, plating, cleaning and various storage needs (appliances, entertaining, baking, etc.). 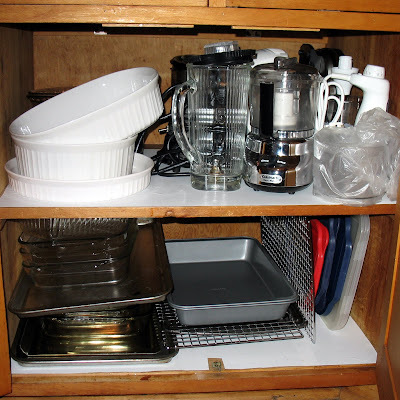 The areas are logically placed and organized well (with only the bare essentials). 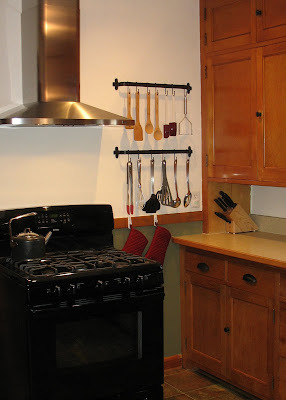 I rid my kitchen of many gadgets, small appliances and utensils (how many wooden spoons does one woman need?!). I plan to sell the items in a garage sale benefitting my mom's Breast Cancer 3-Day team. I'm proud to say that she's a 4-year survivor! Items that don't sell will be donated to Good Will. 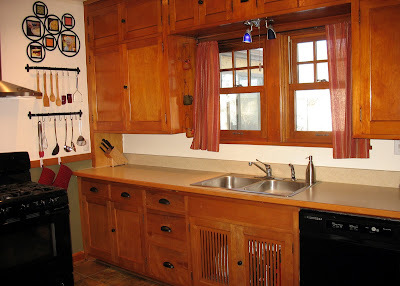 We are very low on cabinet, drawer and counter space in our 1936 kitchen. 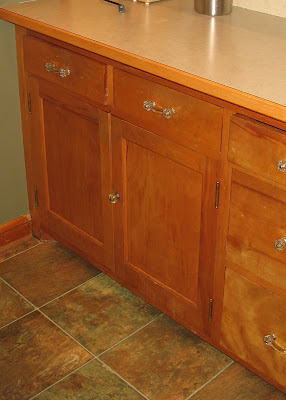 As a result, I had to think outside the box (or, in this case, the cabinets). 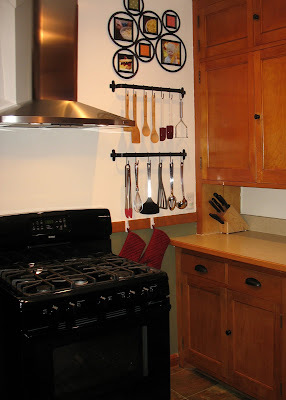 Using two empty wall spaces, I built a pegboard pot rack and installed two utensil racks. (Before and after pictures follow.) 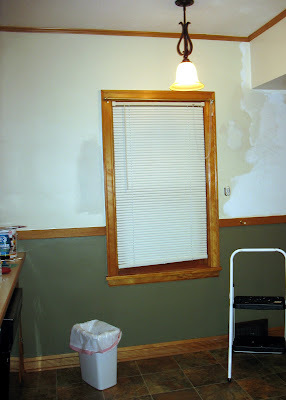 Both solutions were inexpensive and made a significant improvement in how my kitchen looks and works! If there is one word to describe my space, it is: REAL! I live in the real world, with a real budget, real space constraints and a realistic view of what my home can and cannot be. I will never be in Better Homes and Gardens, but my kitchen can serve as a great example for people working with less-than-perfect spaces (and less-than-huge budgets). Too often, people believe that home cooking requires MORE (more gadgets, more storage, more ingredients, more space, more STUFF). 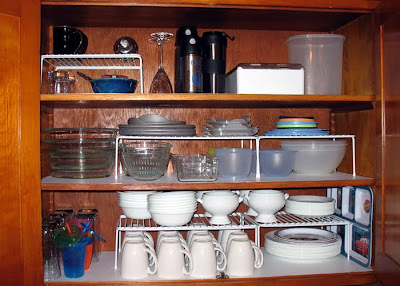 But the truth is that a small, well-organized kitchen can produce meals that are as good (if not better) than a kitchen with space and gizmos galore. Just ask your grandmother! She probably worked in a kitchen very similar to mine. (And she probably had more kids, too!) If she could do it (and if I can do it), so can you! 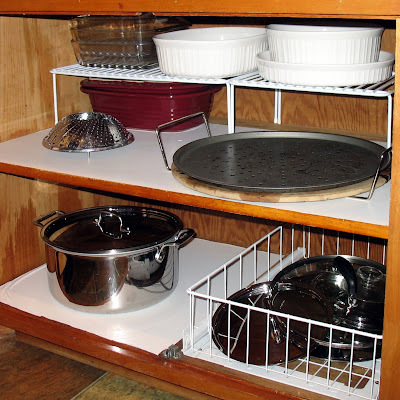 It wasn't very unorganized, but building a pegboard pot rack freed up the space for other items! 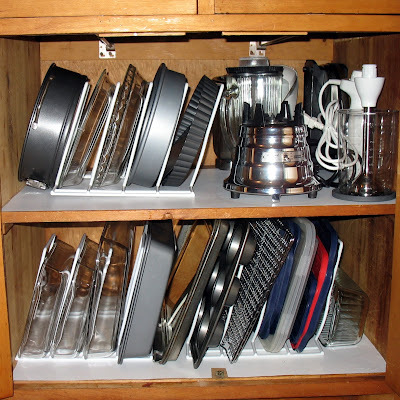 Now, it's not really a pots and pans cabinet. 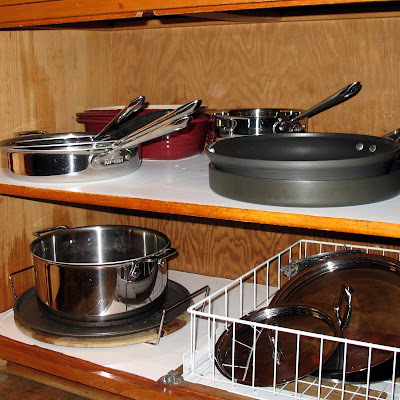 It contains our Dutch oven, larger baking dishes and the lids for our pots and pans. 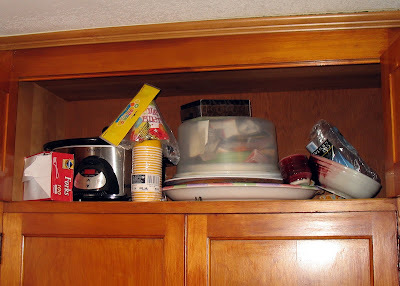 This cabinet wasn't very unorganized, but I wanted to keep like items together. 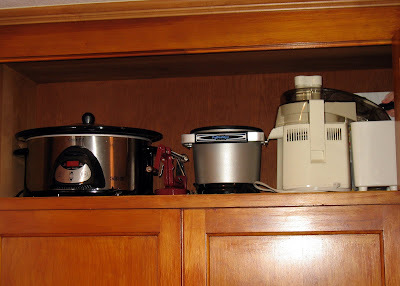 So I moved these lesser used appliances in with their neighbor, the crockpot. 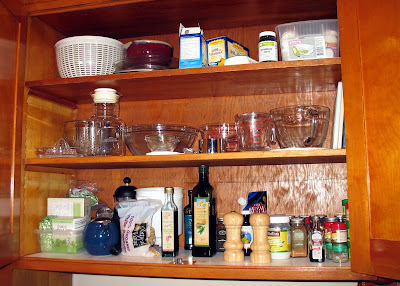 This cabinet just needed a minor reorganization and purge. And before I end this post, I want to give a huge THANK YOU to I'm an Organizing Junkie for giving me much needed motivation to move this project along. THANK YOU! I'm on strike, people! Yep. But don't worry. It's not a melodramatic, "mom's on the edge" kind of strike. I'm just feeling a bit weary of accommodating picky eaters and responding to less-than-stellar attitudes. So on the days when we're home this week (of which there are relatively few), I'm planning to cook for myself and let the hubby and the kiddo fend for themselves. While my guys dine on frozen pizza and other commercially prepared cheese-and-carb concoctions, I will be enjoying some of my favorite meals (and non-chicken proteins) — lovingly prepared for one. The list below only includes my dinner plans. My breakfasts and lunches remain pretty static from week to week. And no links this time. I don't tend to follow recipes for basic pan-fried/braised/sautéed protein meals. Hope you have a great week in food! I know I will! *Note that this is the only chicken dish on the menu for this week. I grow so tired of chicken! 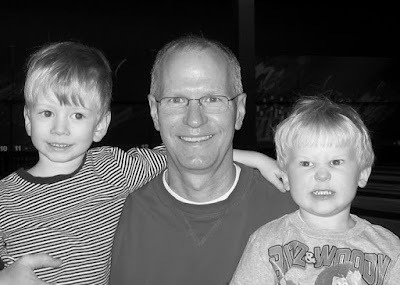 In what has become a yearly tradition, Rowan received a heart-shaped box of candy along with his valentine from us. How could we resist? He love love loves Valentine's Day. And to him, a heart-shaped box of candy is the ideal gift. Remember this video from last year around Valentine's Day? We hope you have a love-filled day and receive whatever your little heart desires this year! 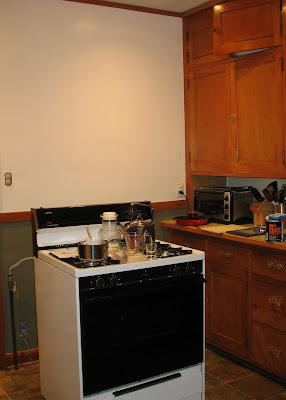 Remember this dreadful sight from the 360 "before" tour of my kitchen? Well, I'm happy to report that we've made significant progress! This weekend, I decided that the wall space above the racks looked rather boring, so I found a funky frame at Target and filled it with food-related pictures and color blocks. 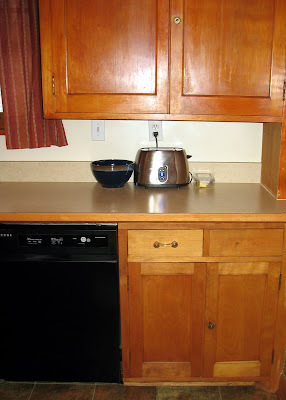 Working with our old kitchen (and our small budget) has been a surprisingly fun challenge! 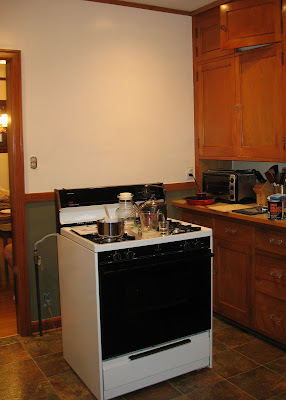 Next step for this area: a backsplash for above the stove. Any suggestions? My son has a frustrating habit of stealing things out of our recycling bin. He uses the items to make art projects, "machines" and — most recently — musical instruments. He might make a mess, but I love his creativity! And I suppose he's right. Reusing is better than recycling. Another week night, another simple fix! 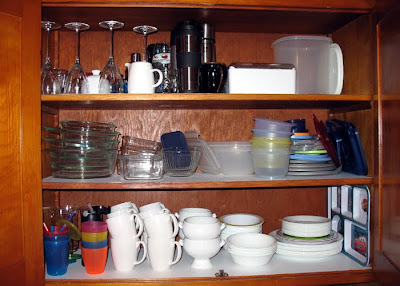 This evening, I emptied out what I call our "food prep" cabinet. 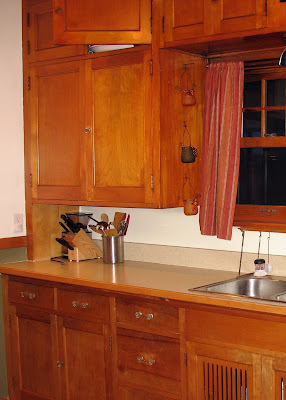 Sitting to the left of our kitchen window, it contains cutting boards, mixing bowls, spices, oils and our measuring/weighing tools. We also keep vitamins and our coffee and tea accessories in here. Once again, the "before" isn't horrible. But there's always room for improvement, right? 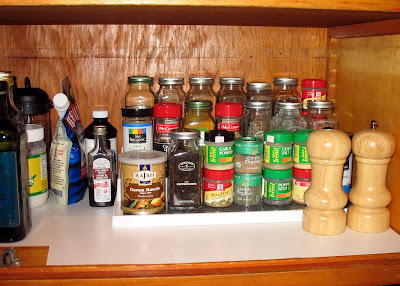 The biggest change is that I bought a three-level spice shelf. Now I can find what I need much more easily! I also edited the vitamin/medicine tote to include only the bare essentials. 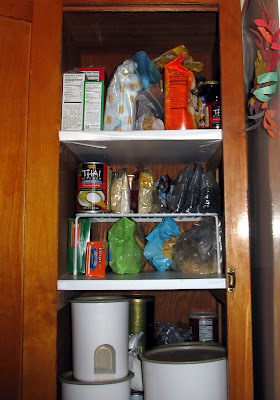 Any duplicate or off-season items (cold medicine, for example) went into our second story linen closet. 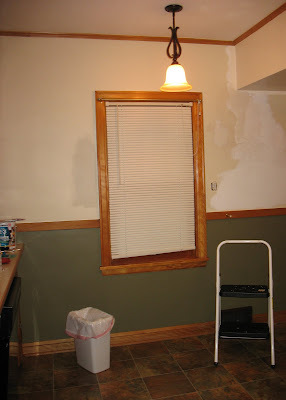 The end result is a much more tidy and functional space. Makes me feel like cooking! 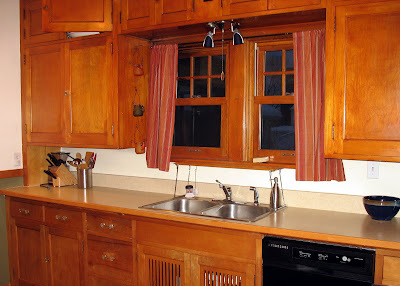 Today for my 28-Day Organizing Challenge and Snyder 5 Blog Hop, I tackled two more of my kitchen cabinets: the little one above the left window and the little one above the large left cabinet. They're the cabinets you can just barely see at the top of this photo. 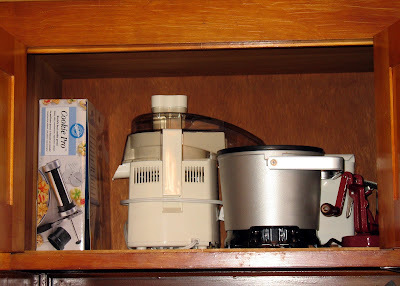 The cabinet above the window contained an assortment of lesser-used appliances and tools: a juicer, a small deep-fryer, a cookie press and an apple peeler. Although we don't use these things very often, I like to keep them around and within relative reach. 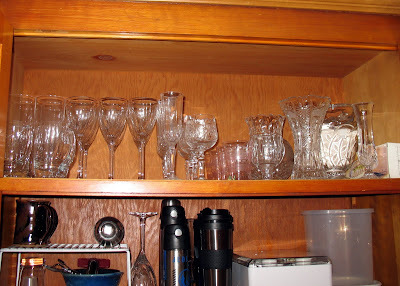 Our little cabinets by the ceiling are perfect for such items. 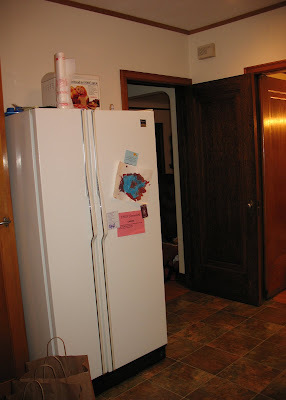 The cabinet just to the left of the lesser-used appliances contained... hmmm... what is this stuff? Random party junk, I guess. 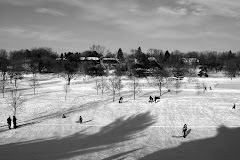 It all got shoved up here after one of our holiday parties last year. 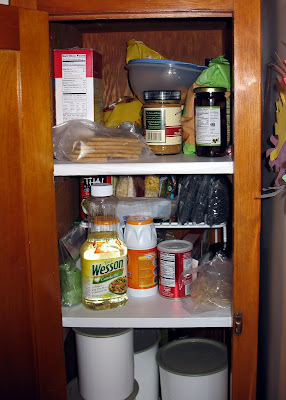 I then turned the narrower cabinet into party storage. 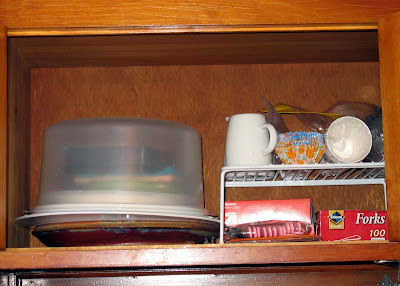 It contains stuff like plastic forks, assorted napkins, a cake carrier and some platters. Those inexpensive wire racks came in handy once again. A simple fix for a Monday night! Another Monday*, another menu plan! Last week went really well. I only had to make one mid-week stop at the grocery store for milk and yogurt. Not bad! And the leftovers fed us for even longer than I anticipated. As a result, we didn't make the curry or picatta last week. 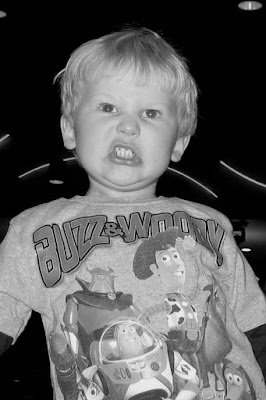 Our only food-related frustration was Kiddo's picky eating. Remember the night he ate popcorn for dinner? So before I get into this week's menu plan, here is an excerpt of our new picky eater plan (courtesy of Ellyn Satter). I guess it's not a plan as much as a reminder of what I am and — perhaps more importantly — am not responsible for when it comes to my child's eating. Fundamental to parents’ jobs is trusting children to decide how much and whether to eat. The bottom line: it's time to lay off! I will provide a variety of healthy foods at every meal. Dessert, which is usually fruit anyway, will not be a secret temptation reserved for those who clean their plates. All of our mealtime options will be presented at once. And kiddo can choose whether to eat and how much. TBD: Not sure whether we'll be away from home, or having company over, or what. *Notice that my menu plan doesn't actually begin on Monday? That's because I work all day on Mondays! A Sunday grocery shopping/planning session works much better for my schedule. **My family LOVED this tomato sauce last week!